Thanks to Ian, Jay, and Tom, of Surprise Attack, for hanging out with us in the studio this week! ***The first time we've played this artist for you on the show, & a new artist profile added to our DC Artist Database! Brian: On DC Music Rocks, we're shining a spotlight on the great songs, artists, and incredible people behind the DC region's local music scene. And Surprise Attack pushes the envelope when it comes to seamlessly blending genres and improvisation. Their unexpectedly eclectic blend of funk, jazz, rock, roots music, and hip-hop, is something they often call Mountain Funk. Multi part harmonies, searing instrumental leads, dynamic rhythmic breaks, and nostalgic covers are only a few of the tools Surprise Attack uses to entertain and delight you when you come and see them. This five piece group demonstrates a keen ability to reflect the energy of an audience back at them, and creating unique and unforgettable experiences. They're also great dudes. I came across these guys way back when I started the show, and I've been following them for two years ... two plus years, at this point, and I love all these releases. It is such a treat to now get to share you guys with everybody listening. Thanks for being here, guys. Tom: [crosstalk 00:00:57]. Thanks, Brian, yeah, it's great to be here. Brian: This is awesome. What is it that makes Surprise Attack special? I talked about the blend of the different genres of the Mountain Funk, and then there's also that ... I talked about the ... sending the energy back to the audience. What else? What makes you special? Tom: It's the friendship at the core. Really, we've been extremely close friends for a really long time. We're all odd. We're quirky. And I really think when we get together, we just ... we really click in a way that is special, and I think the music that we put out is a direct reflection of that. Brian: Absolutely. And if they haven't been to a Surprise Attack show, what's it like? Jay: We try to project fun. Fun is what we've got from a lot of people, so we try to read the crowd and sort of the venue, and try to cater the musical experience to that, because you don't want to just come up there with the same couple songs that you always do. Jay: People might get bored of that really quickly, so we like to really ... Our name is Surprise Attack. We like to really [crosstalk 00:02:12]. Jay: ... any idea of what's coming, so when you hear, it's supposed to give that feeling. Brian: That's awesome. So now, right along those lines then, when it comes to memorable moments where you surprise attacked someone, what comes to mind for the most successful moment for surprise attacking people? Ian: Well actually, recently we played ... What was the name of that bar we played? Ian: Yeah, the Midlands. And we went into ... Oh, sorry. And we went into Cali Love ... California Love, but Tupac. Ian: Yeah. That surprise attacked the hell out of everybody. Brian: I can only imagine. Wow. And knew all the words? Rapped to it? Ian: Yeah, the bartenders were all taking videos and everything. They loved it. Brian: That's awesome. What a cool thing. I love it. And now, the story behind the name. Surprise Attack, where did that come from? Tom: Believe it or not, Surprise Attack formed a little over 10 years ago, the first time. We were a pop/punk sort of outfit. Tom: Yeah, we were a pop/punk sort of outfit, so Surprise Attack was a great name for us then, and then we came back, we all loved jam music, and yeah, just the [segging 00:03:29] from one song to the other, the unexpected songs that come in and out of the sets. Surprise Attack just worked, and we've kept it ever since. Brian: Got it. The name was actually ... That was the name of the pop/punk group too? Brian: So, it's been Surprise Attack since the beginning. Brian: Wow. And how long of a break was it between when you stopped and came back? Tom: It was like eight, nine years after our pretty much permanent hiatus, that we all decided to move back to DC and then start playing music again. Brian: And when you say, "We all", describe all the members and the pieces of the band. What makes up Surprise Attack? Ian: Well, at first was me and Tom, the guitar ... Sorry, this is Ian on the drums and Tom the guitar player, and then we had [Gerry 00:04:13] on the keys and Danny on the base, originally. That was when we were in high school. Then once we split up, got back together, and [Jayro 00:04:23], the percussion player joined the band, and that's been over a year now. Jay: Yeah, it was kind of ... I knew all these guys back then too, as well, but we all ended up going to different colleges, and so we were spread out. Ian: Except for Tom and I. We both went to Virginia Tech, and that's where ... I had my electronic drum kit there that I could make work in the townhouse that I had. Then Tom would come over and jam, so that's kind of how me and him started musically collaborating. Once we all sort of moved back to this area, after the college period kind of, then got back into it. Brian: You described ... I hear six people. Yeah? There's six? Tom: There's five of us. Brian: Five of us. Got it. And the instrumentation is two drums ... What is it? Tell me the rest. Tom: We've got the standard traditional drum kit. We got Jayro who plays percussion, like [tongos 00:05:25], bongos, all sorts of random fun loud-making stuff. Tom: Guitar. We got keyboards, and we've got base. Brian: And base. What a great ... And that means you can play any cover too, because you've got all the instruments you need to do that. Oh man, guys, that's fun. What about ... Outside of the music thing in your personal time, I want you guys to each share. What do you do for fun? Outside of that. Ian: Well actually, coincidentally, I started doing music lessons. I know this is music related, but that's actually what I do for my job now. Brian: Really? What kind of ... so you teach lessons? Ian: I teach drums, guitar and piano. Brian: Where is that? Where do you do that? Ian: It's at a place called Bach to Rock. Ian: Yeah. Teaching kind of from six to 13 or so. Younger kids. Ian: Yeah. It's a lot of fun. Jay: This guy can play everything, man. Brian: [crosstalk 00:06:29], like whatever you want. Wow, man. That's amazing. Ian: All the rock instruments. Brian: Awesome. And what else? About the rest of you? Tom: ... the thing that eats up the most of my time outside of the band. Brian: Now, when you say, "Huge", does that mean daily, twice daily? Tom: Not twice daily. It's definitely a daily thing for me. Sometimes more than others, but it's just been a huge part of my life for the past four or five years. It really keeps me grounded. Brian: Grounded is such a good yoga word, that they use. [crosstalk 00:07:02] associated with it. Do you go to a studio to do this, or do you teach it, or do you just do it at home, or what? Tom: There's a ton of great studios around Arlington, Virginia. Everywhere in northern Virginia and DC has them. I'll do stuff at home. I'll do stuff at studios. I like experimenting. Doing with a community is nice, and then practicing on my own can be nice too sometimes. Jay: And this is Jay, and I started skateboarding at six years old and used to do it competitively. I don't do it as much anymore. I'm kind of a big guy to be skating. It hurts when I fall. Jay: Well, I'm 6'4" and weigh about 200 pounds. Brian: Got it. Yeah, that is pretty tall for skateboarding. You're right. Ian: Everybody in this band is really tall, except for me. Everybody is six feet and above, and I'm standing here over here, 5'9". Brian: So Ian, the 5'9" under the giants. Brian: Oh god, that's amazing. Jay: But yeah. I don't do it as much anymore, but I still get out there a lot, and still try to do some crazy stuff from time to time. Brian: Nice. I like it, guys. One of my favorite questions to ask, and I want each of you to answer it is, if you could offer one piece of advice, what would it be? Brian: I'm going to leave it entirely up to you. Brian: It's just your piece of advice to whoever. Jay: Listen to Surprise Attack. Tom: This is why we put Jay [crosstalk 00:08:28]. Brian: That was Jay, and Jay, you still got to come up with something else. But we do love that advice. I do. I do. Ian: That's just good advice for life, in general. Listen to Surprise Attack. Brian: Absolutely. I would say, "And then go to a show and be surprised and attacked." There's that too. Go ahead, Ian, what do you got? Ian: Well, I guess for bands in the area starting up and stuff, just going to a bunch of different shows and supporting local music and stuff is definitely ... definitely was a big help for us, as far as just making friends and also seeing different styles and stuff like that. Listen to as many people as you can, I would say. Brian: Awesome. That's cool. What about you, Tom? Tom: I got to say, just in general, do your do. Brian: Do your do. It sounds like a Mountain Dew commercial. Tom: It's not a Mountain Dew commercial. There's a lot of things that we're told that we can't do, we shouldn't do, things that are just a bad idea for us to go down. In particular, as a musician, that one really strikes home for me. Really, just if you've got the passion to do something, absolutely go for it, and give it everything you've got. Brian: I like that one. Absolutely. All right, Jay. Your second shot. More advice. I was only asking for one, but you're allowed two. Jay: Drink a lot coffee, so that it can support you to ... As a musician and everything, it's ... As you're coming up and trying to really make it work, you still got other things in your life you try to balance and get everything together, but just every time that I'm ... just kind of notice I'm sitting around and doing nothing, I just kind of have the realization, and just try to stay energetic, and stay on the path towards achieving whatever I've set out to achieve. I just try to have a lot of energy when it comes to that, just so that I can achieve kind of a good balance with my goals and living life. Brian: Absolutely. When you have those moments, take advantage of them and do the stuff that's important, not just [inaudible 00:10:44]. I like that. I like that. Cool. And for those folks who want to find out more about Surprise Attack, where do they go? Tom: SurpriseAttackDC.com is the definite place to get any and all Surprise Attack information. Looking us up on Facebook also. There's a ton of information, and all of our music is available for free for download; Band Camp, SoundCloud, Spotify, iTunes. Brian: That's amazing. All right. And is there one social media that you guys do more on than the others? Thanks to Chris Cassaday for hanging out with us in the studio this week! Chris Cassaday is a folk-funk singer/songwriter from Arlington, Virginia. Chris's unique blend of blues, folk and funk, his crafty songwriting style, his unpredictable set lists, and his thunderous, distinctive voice have captivated audiences in the DMV, up and down the east coast, and around the country. With two albums released, a song being played on SiriusXM radio's the Coffeehouse, and a resume of hundreds of amazing performances under his belt, Chris has proven himself as a must-see act in the Washington D.C. music scene. 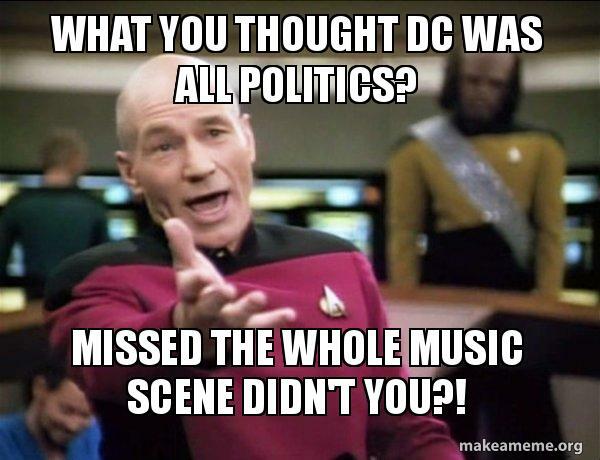 Brian: Here on DC Music Rocks we are shining a spotlight on the great songs, artists, and incredible people behind the DC region's local music scene. Chris Cassaday is a singer-songwriter from Arlington, Virginia, with a unique blend of blues, folk, and funk. His crafty songwriting style, his unpredictable set lists, and his thunderous, distinctive voice have captivated audience in the DMV for a while. With two albums released, a song being played on Sirius XM Radio's The Coffeehouse, and a resume of hundreds of amazing performances under his belt, Chris is an awesome act, and I hope you get to see him live at some point. I first came across him doing this show, and I've been such a fan of his music, and now I actually get to have him here in the studio with me and this is such a treat, man. Thanks for being here. Chris Cassaday: Thanks for having me. Brian: Wow. So, Great Falls and then into Arlington. Now did you go away for school, or have you really been Virginia the whole time? Chris Cassaday: I don't know if I would call it going away. I went to JMU in Harrisonburg. It's a couple hours away. It's far enough where your parents can't bother you, but close enough where it's not a hike to get home. Brian: So you've really been in the area for your whole life pretty much. Chris Cassaday: Yeah pretty much. Always been around Virginia in some way, shape, or form. Brian: And where and when, how did music start? Chris Cassaday: Well my dad got me my first guitar when I was 14 years old. And I had always been singing, when I was a little kid, singing in the backseat. I had a really deep voice as a kid and everyone used to make fun of me for it. Chris Cassaday: My dad was like, "You sounded like Rod Stewart when you were like six years old." But I was always singing. So he was finally like, he got me a guitar, and I took lessons for a brief period. And it always just stuck with me; I loved it. And it kind of developed as I got older; I was in bands in high school. And when I went to college at JMU I kind of got into the whole solo acoustic thing, just sitting in my dorm strumming and writing down lyrics. And really fell in love with it. Brian: And it's always been guitar, or other instruments too? Chris Cassaday: You know, I actually started on bass. I was a bass player first. Chris Cassaday: Yeah. But was taking guitar lessons while I was playing bass in the band, you know, and then we kind of did a whole switcheroo thing in my high school band where we got to play different instruments, so ... I was kind of learning two instruments at the same time. Brian: Nice. So guitar and bass. Brian: Wow. And what age was this again? When did that start? Chris Cassaday: That was like age 14 probably, yeah. Chris Cassaday: High school, exactly. Brian: The music education kicked in. Got it. Wow. So then what's your earliest memory with music? What comes to mind? Chris Cassaday: Oh man. My earliest memory with music is ... Oh boy. This is tough. Probably singing, I can't believe I'm saying this on the air. So, I sang a Nickleback song in the sixth grade talent show, when I went to the [inaudible 00:02:48]. Brian: Don't judge him! Don't judge him! He did. Chris Cassaday: No judgment here, folks. I sang "How You Remind Me." Brian: Yeah. Oh, that was huge back then. Chris Cassaday: But, we played the karaoke track of that and I sang it and, needless to say I was a stud at my elementary school for the next few weeks. Chris Cassaday: It was just like everyone performs; there wasn't an actual winner, yeah. Brian: Oh a showcase, I gotcha. Wow. Chris Cassaday: But, I think I won. Brian: Oh that's funny. So you are secretly a Nickelback fan. We'll keep that a secret between us. Brian: And whoever's listening. No. And that was your first memory I guess performing too. Brian: It would have been that one. Wow. Alright now, so outside of music then, you've got to have some hobbies and stuff. What do you do outside of music? Chris Cassaday: Well me and my girlfriend Haley live up the street in Rosalind, and we go to a lot of concerts, whoever's in town. Chris Cassaday: Yeah, we went to a ton of concerts this summer. I mean, I love music, local and big shows. Also, I love hockey, a big hockey guy. I play adult league hockey. Chris Cassaday: In fact I have to meet up tonight at Kettler. Chris Cassaday: At like, 11 p.m. tonight; it's late. Chris Cassaday: Late till ... but I love hockey. Brian: And this isn't roller hockey; we're talking ice hockey. Brian: Oh, you seem pretty trim to me man. You don't look terrible. Chris Cassaday: It's like riding a bike, except way more humiliating if you mess up. Brian: When you mess up, I got it. And like shows, or other, there's a little bit of ice hockey and some going to see concerts. And anything else? What else is his life like? Chris Cassaday: Um, I'm trying to think here. Traveling. Love to travel. I like getting out of town whenever I can. In fact we were talking, Haley and I just got back from Ireland; I was there for nine days. Brian: Get out of here! Chris Cassaday: Yeah, I loved it. Brian: Where in Ireland did you go? Chris Cassaday: We started in Dublin and rented a car and drove around the country. Which is terrifying by the way, driving on the other side of the road. Chris Cassaday: It was terrifying. Brian: Oh, because they drive on the opposite side. Brian: Wait, who drive, did you or Haley drive? Brian: You want to be in control. Chris Cassaday: But it was fantastic, my first time in Europe. I had a blast. Brian: Wow. First time. Congratulations on making it to the Euro Theater for the first time, man. Brian: Holy smokes. Alright now, so funniest moment that comes to mind in performing now? Brian: Sure! That's good. Yeah. Chris Cassaday: Okay. There's a few, but the one that always comes to mind when people ask me like, about embarrassing moments was, I was playing with this high school band I was mentioning. In front of the whole school; we had this place called The Commons, which was like the middle of the school, and we were playing, and the whole school was watching, and I was jumping around, you know, playing bass, and my strap broke and my bass just fell to the floor. Chris Cassaday: In the middle of a song. And I was just like, "Uhhhh ..."
Brian: Did it break too? Brian: Hoping nobody saw that. Chris Cassaday: No, but it broke. Chris Cassaday: Since then I got the locks you know, so the strap won't go anywhere. Brian: Right, yeah, the strap locks. By the way, a public service announcement for any guitar players, make sure you have strap locks. Brian: A best practice. Nice. Courtesy of Chris Cassaday's amazing moment from performing. Alright, so tell us a story about a time you tried and failed. Chris Cassaday: Tried and failed? Oh boy. One time I tried to cover a Bruno Mars song and just absolutely failed. Brian: Oh! Which one? Do you remember? Chris Cassaday: It was ... (singing). Brian: Okay wait a minute. Just for the record, how does it go, one more time? Chris Cassaday: (Singing.) Yeah, see that's exactly why I tried right there. Chris Cassaday: That was a long time ago. A lot of people, I don't even think Haley knows about that, but it was at an open mic and I was like, "You know I'm going to go for it," and it didn't go well. Brian: Didn't go well. Oh my gosh, that's amazing. Now, and what do you have in your musical, aside from Bruno Mars now, what do you have in your music collection that might surprise us? Chris Cassaday: I love doing like mashups of songs. I've got a lot of Dave Matthews in there; I do this Dave Matthews song "Jimi Thing" and I mash it up with "For What It's Worth" by Buffalo Springfield. Chris Cassaday: In addition to old songs like Buffalo Springfield, I'll do newer, like rap songs. "Hold On We're Going Home" by Drake. And I've got a lot of reggae in my repertoire. Love reggae music. Chris Cassaday: A lot of Sublime in there, stuff of that nature. And I also do a mean "Lose Yourself" by Eminem. Chris Cassaday: Like at the end of a show. Like, if the crowd's kind of dying down, I'll just do like the (singing) and [inaudible 00:07:43]. Chris Cassaday: Yeah, that's one of the biggest surprises in the set. Brian: That's so funny. And so these are when you're playing two and three hour sets, just you and your guitar, you're tossing these covers into it? Brian: You have anything that you don't cover, that's in your music collection that you're a fan of, but you don't necessarily cover? Or do you really play it all? Chris Cassaday: I try to play it all. My setlist is always super diverse. I try to like, surprise you with the next song, you know? It could be anything, you never know. Brian: God, that's amazing. I can't wait to catch another one of these shows, man. Now, do you have any rules that you always end up breaking? That you've set for yourself? Chris Cassaday: Not drinking the night before a big show. Brian: Alright, so it's "I'm not going to drink" and "I'm going to go to bed on time," and "I'm not going to be hungover before the show." Except, that might happen. Brian: Right, and then it happens again. Oh, that's really funny. So now, one of my favorite questions to ask, actually I've got, I'm going to do this one in two parts. What is the best piece of advice you have ever gotten from someone? And this can be in general, it doesn't have to be music. Chris Cassaday: Best piece of advice I've ever gotten from someone was, Dave Matthews, who said, in an interview he said, "Play for anyone you can, anywhere you can, at any time. You never know who's going to hear you." Brian: That's amazing. And is there like a story that comes to mind as to like, someone you've ended up playing for that, that was a surprise? Chris Cassaday: Well, I mean, the way I started getting all of these gigs was, I went to an open mic on like a Monday night out in Sterling and a promoter guy by the name of Dave [Mastell 00:09:40] heard me and started booking me at pubs and restaurants, and that's how I started booking these big gigs, was through him. And I just happened to be at that open mic at that night and he heard me, and now I'm, paid gigs on the way. You never know what's going to happen or who's going to be there. Brian: Wow. That's amazing. And, are you entirely a musician? Do you have other jobs, like part-time jobs as well? Chris Cassaday: By day I am a financial planning administrator at a wealth management firm. And then by night I'm a singer-songwriter. Brian: Fantastic. See, and I love it; and you know, sometimes we, I don't want to say "joke" about it, but sometimes I feel like there is this conception that, "Oh, well no I do have a day job." But what's amazing is that so many folks in the DC region that, very, a lot of folks have that same story, they work during the day and then they play shows at night, and they really are incredible at both of them, which is kind of, it's amazing to see, so that's awesome, man. Brian: Alright, so now what's one piece of advice you would offer? Brian: So say more on that; what does that mean? Chris Cassaday: I mean, just practice as much as you can. There's no, you can never practice too much, in my mind. There's nothing wrong with being overly prepared for your shows. Brian: So what does that look like in, does that mean you play with the band but then you go home and play for two more hours? Chris Cassaday: You've got to, in a band particularly, you've got to practice on your own, not just band practice. Chris Cassaday: You know, working on your own so when you get together with the group, everybody's done their part, you know? Chris Cassaday: It's usually like, I'll listen to the whole song, if it's a cover. And then I'll just try to play the whole song. And if I get stuck at a part I'll fast forward to that part, learn it, et cetera et cetera. Brian: And then rewind that one part until you can play that, and then you play it all the way through. Brian: Wow. That's amazing. Alright. Now, for those folks who are interested in learning more about you and the cool things happening, where do they go? Chris Cassaday: Well, you can check me out on Facebook, Facebook.com/ChrisCassadayMusic; it's got all my info on my shows. All social media, for that matter, Instagram @ChrisCassadayMusic, Twitter.